WorldClassRoom FAQs - How do I update my syllabus? If you need to edit a syllabus while preparing your new session, you can easily do so in WorldClassRoom. After logging into a course, click Syllabus. To edit a syllabus in non-SBT courses, click the button "Edit Syllabus Description." SBT syllabi will be embedded with the Concourse Syllabus Generator tool and will be editable from the normal Concourse edit button. 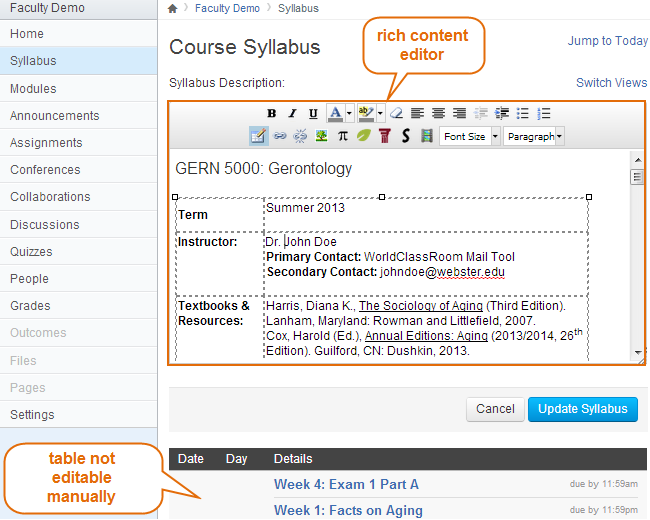 You can edit the syllabus by typing in new content directly in the Rich Content Editor. With the Rich Content Editor, you have the ability to format text (bold, italic, underscore, etc.) in similar way as you do in Microsoft Word documents (PCs) or Pages (Macs). Note: The text above the course activity table is editable. But the table itself cannot be changed manually. To change the order of the activities in the table, you'll need to modify the setup of those activities, and then the changes will reflect in this table automatically. When you finish editing, remember to click Update Syllabus to save the changes. Otherwise the changes will not be saved.